For more than 40 years, Bradford Woods has been working with students and teachers throughout Indiana, providing experiences that encourage students to learn about the outdoors in an actual outdoor environment. The environmental education program builds upon a tradition of teaching through hands-on experience while motivating students to take better care of the earth and its resources. The focus on learning R.E.S.P.E.C.T. carries through all aspects of the program including Trail Activities and a residential 3-day program. 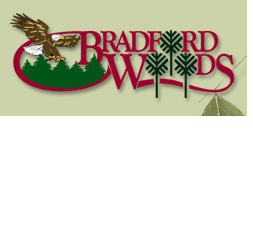 For many students, Bradford Woods is their first real life experience in an outdoor environment. Through educational modules, students learn to respect the environment by taking action. For example, during an Environmental Awareness and Action module, students demonstrate environmental responsibility while implementing a project to reduce topsoil erosion. Environmental ethics are emphasized using a Wild Edibles lesson as students practice sound harvesting methods. In Aquatic Life, students integrate biological and physical science using pH tests, dissolved oxygen kits and biotic indexes to determine the quality of water in lakes. After collecting a variety of aquatic insects and invertebrates for the biotic index, students practice protection of these animals as they carefully return them to their natural habitats. Throughout all modules, classroom studies are enhanced by direct experience with the environment. Whether writing a poem about a soaring Bald Eagle seen catching a fish, or listening to Native American legends while gazing into a starry night sky, students see their textbook pages come alive. In the process, they gain a greater appreciation of the natural world and understanding of concepts in science and other areas of the curriculum. 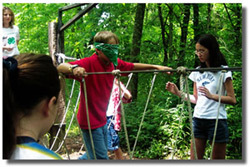 Finally, challenge and teamwork are incorporated into all Trail Activities as students work in small groups to discover life inside a rooting log, build a fire or complete an initiative. In this residential 3-day program, students also learn RESPECT for themselves and others. Living in a cabin with peers, teachers and chaperones, students take care of themselves by being responsible for their belongings and making sure they are prepared for the day’s activities. Students provide service for their classmates by participating in daily cabin cleaning, and “Hopper, Weather, and Flag” duties before meals. In addition, meals are served “family style” at tables of eight to ten and supervised by a teacher or chaperon. No student is ever denied the opportunity to attend due to financial circumstances. The Foundation of MCCS provides camperships for those in need of financial assistance.